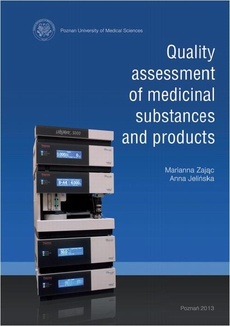 Quality assessment of medicinal substances and products is based on the polish‐language monograph Ocena jakości substancji i produktów leczniczych, edited by M. Zając and A. Jelińska, published by Wydawnictwo Naukowe Uniwersytetu Medycznego im. Karola Marcinkowskiego w Poznaniu, 2010 (The Science Publishing House of Poznan University of Medical Sciences, 2010). In the present monograph, the analytical methods for medicinal substances were adjusted to Ph. Eur. 7.0/Pharmacopoeia Polonica IX whereas those for medicinal products to BP 2011 and USP 35.
appropriate quality ensuring safety and use efficacy, they should meet all criteria regarding their identity, purity, content and usefulness that are contained in relevant documents, including pharmacopoeial monographs. In Poland, the obligatory document is currently Pharmacopoeia Polonica IX, a Polish translation of European Pharmacopoeia 7. To confirm the identity of active substances and excipients, tests that allow their unambiguous identification are used. The preferred methods of identification are infrared spectrophotometry (IR) and chromatography. The confirmation of identity by using IR involves comparing the spectra of the substance to be examined and those of the reference substance obtained under the same conditions or comparing the spectrum of the substance to be examined with the reference spectrum provided by Ph. Eur. for this substance. High‐performance liquid chromatography (HPLC), thin‐layer chromatography (TLC) and gas chroma-tography (GC) are the most commonly used chromatographic methods, with HPLC being generally preferred. In chromatographic methods, the confirmation of identity is obtained by comparing the retention times or retardation factors (TLC) of the substance to be examined with those of the reference substance. In order to confirm identity, studies of physico‐chemical properties such as solubility, optical rotation, refraction index, the melting point of substance to be examined and its derivatives as well as chemical reactions typical of that substance are recommended. It is necessary to identify the structure of active substance mainly after its production, in metabolism studies and in drug poisoning treatment, which can be achieved by using such spectrometric methods as ultraviolet and visible spectrophotometry (UV‐Vis), infrared spectrophotometry (IR), proton nuclear magnetic resonance spectrometry (1H NMR), carbon‐13 NMR spectrometry (13C NMR) and mass spectrometry (MS). This book presents a wide range of methods for confirmation and identification of active substances. confirming their purity. Impurities may originate in the synthesis or processing of active substances as well as during the storage of active substances and pharmaceuticals. importance. In testing for related substances, chromatography is the method of choice. Enantiomeric purity is assessed by using chromatographic methods or those based on optical rotation. Regarding method specificity, although in quantitative determination specific methods are preferred, they are not always necessary (especially in volumetry) because related substances, whose levels are controlled by specified limits, may behave like active substances. This book is concerned with the above‐mentioned tests and the identification of active substances with spectroscopic methods. In terms of chemical structure, active substances are divided into the following groups: alcohols, phenols, carboxylic acids and their salts, amino acids, enols and imides, sulfonamides, organic bases and salts of organic bases. Each of those groups is provided with an introduction presenting physico‐chemical properties, chemical reactions typical of a particular substance and the whole group, spectroscopic analysis and spectrum interpretation, purity tests and assay. The mechanisms of reactions used in identification and assay are also included, wherever possible. As the methods used should be reliable, they require validation according to the International Con-ference on Harmonization (ICH) guidelines with the exception of pharmacopoeial methods, which are validated during their elaboration. Pharmacopoeia Polonica IX and Ph. Eur. 7 do not contain individual monographs of pharmaceuticals but general monographs of drug forms. In this book, the methods dealing with pharmaceuticals were prepared in accordance to individual monographs available in USP 35 and BP 2012. In order to provide the basis for the analysis and interpretation of study results, seven chapters precede those concerned with the drug groups: introduction, impurities, validation of analytical procedures, spectrometric methods for the analysis of medicinal substances and products, chromatographic methods for the analysis of medicinal substances and products, ionic equilibrium in electrolyte solutions and titrimetric methods of analyzing medicinal substances and products and methods of drug form assessment. The Introduction contains the nomenclature of active substances for pharmaceutical use, the gen-eral rules of developing Ph. Polonica and Ph. Eur., guidelines concerning harmonization of pharmacopoeial requirements and directions on the use of pharmacopoeias. The chapter Impurities details the origin and classification of impurities, their reporting and qualification thresholds and examples of impurity profiles. Validation of analytical procedures contains validation parameters, statistical assessment of results and examples of method validation for the determination of active substances and impurities. Spectrometric methods for the analysis of medicinal substances and products concerns the basis for those methods and provides examples of spectra interpretation and application of each method in drug quality control. Tabular data for spectra interpretation is also included. contained in Chromatographic methods for the analysis of medicinal substances and products. Ionic equilibrium in electrolyte solutions and titrimetric methods of analyzing medicinal substances and products gives the rules of calculating the pH values of solutions and the degree of ionization as well as titrimetric methods used in the determination of medicinal substances and products. Finally, the chapter Methods of drug form assessment presents tests and criteria for acceptance limits. This monograph, intended for students of pharmacy and similar subjects as well as for analytical laboratory workers, is supported by a large number of reaction mechanisms, tables and UV, IR, 1H‐, 13C‐NMR and MS spectra of substances for pharmaceutical use. We realize that due to the dynamic development of analytical methods, increasing quality require-ments and the need for pharmacopoeial harmonization this teaching materials has to be regularly updated. Therefore, we will appreciate any suggestions and criticisms that may help us to improve the next edition of this monograph.